The ancient city of Pinara probably belonged in Hittite times to the Lukka countries named by the Hittites. 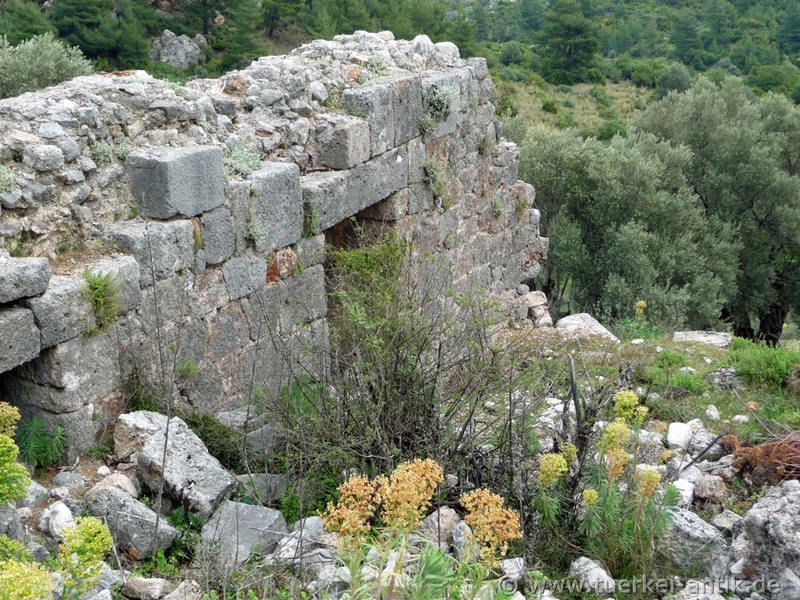 The historian Menekrates of Xanthos reports of a city being founded by emigrants from Xanthos, which would explain the close connection between the two cities. Pinaras biggest flowering began from the 6th century B.C., so that it could take over a leading role in the Lycian League. The city was struck by several earthquakes. After the devastating earthquake of 141 AD, Opramoas of Rhodiapolis donated a considerable sum of money to repair public buildings in Pinara. The area of the settlement is richly covered with partly well-preserved buildings, which form a necropolis on a hilltop. 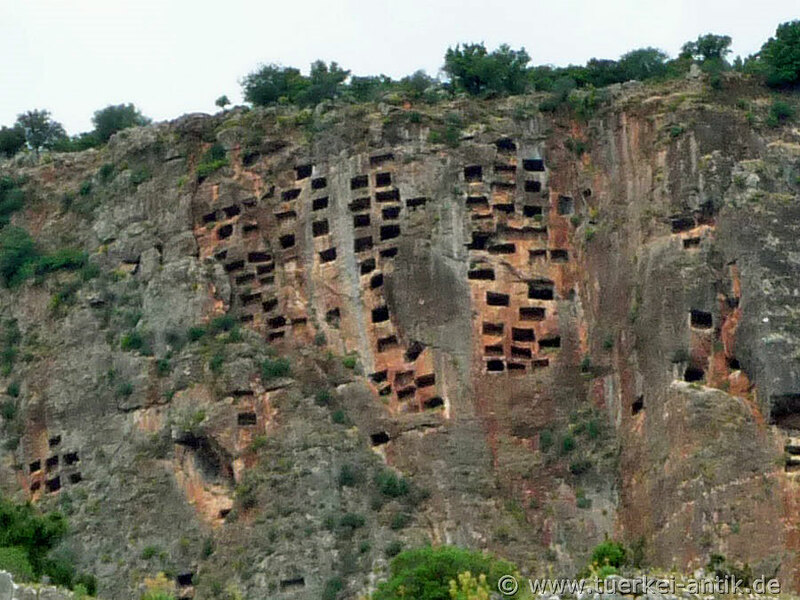 In the past, however, some objects served as quarries for the nearby village of Minare Köyü. 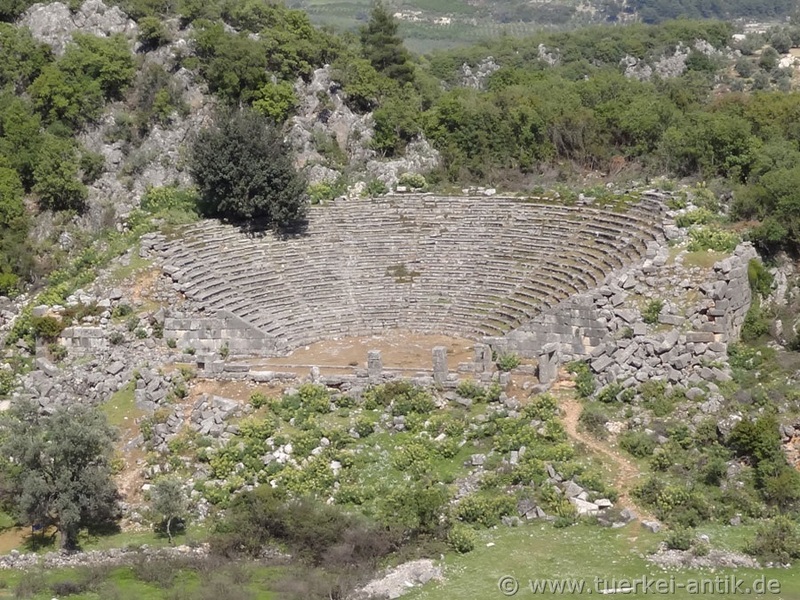 The original Hellenistic theatre from the 2nd century B.C. was rebuilt around 175 - 210 A.D. under Roman rule, probably with the help of funds from the Opramoas of Rhodiapolis. Today it has a single tier with 27 rows of seats. The stage house is destroyed except for its foundations. The parts of the building, which had fallen down due to earthquakes, lie scattered on the slope below the theatre. Pinara had three votes in the Lycian Confederation. In 334 B.C. the city surrendered to Alexander the Great. After Alexander's death, the city fell to the Kingdom of Pergamum. Pergamon's last king, Attalos III, decreed that after his death his kingdom should fall to the Roman Republic. He died in 133 B.C. The city experienced a new heyday in the Roman imperial period. Most of the buildings recognizable today date from this period. 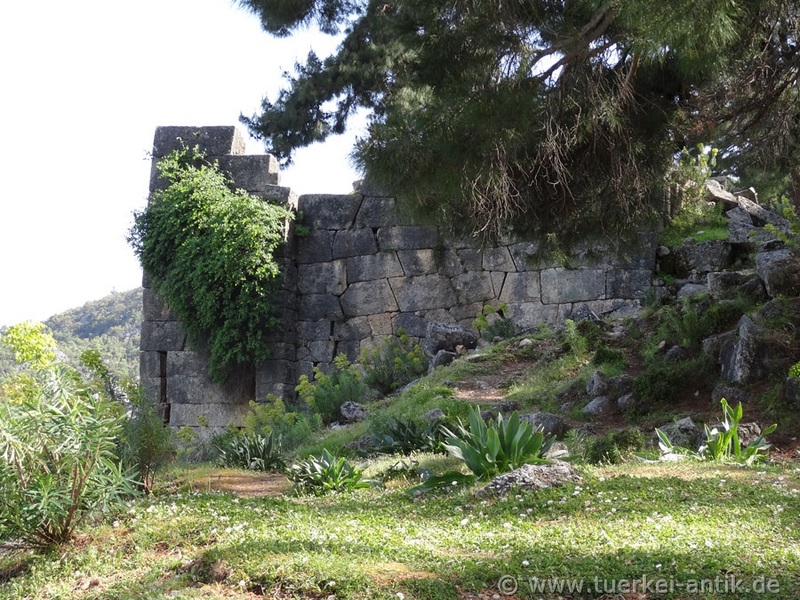 Lycian temple tomb from the 4th century B.C. The remains of several ancient temples, well over 900 rock tombs, including some "royal tombs", an upper and a lower acropolis, a theatre, an odeon, an agora and a church, have survived. As in all Lycian cities, the typical sarcophagi with their barrel-shaped gables can be seen in the surrounding countryside. 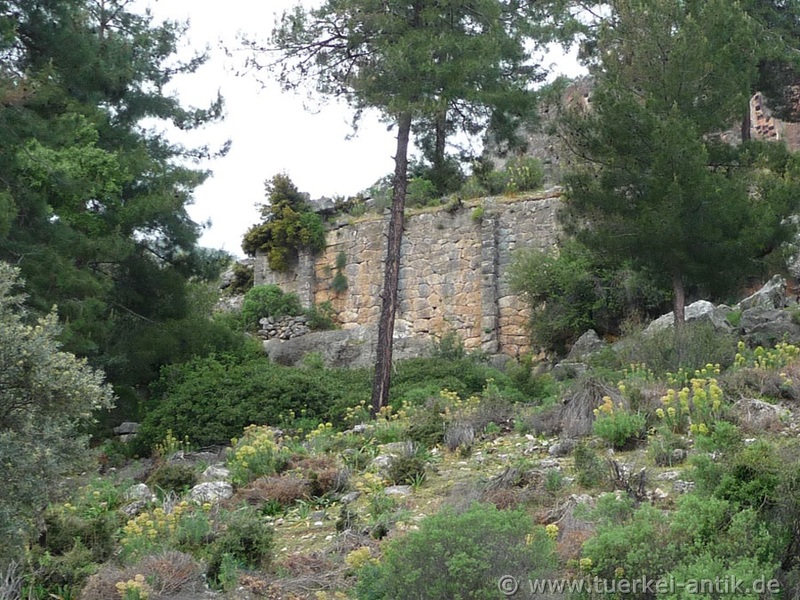 The completely different rock tombs and especially the faceless burial caves in the steep face of the castle mountain were for a long time the reason for an intensive exploration of Lycian grave architecture. In the meantime, it is considered certain that the simplicity of the burial caves is due to the moderate quality of the rock and that even high-quality facades made of wood or stone were found in the now unadorned openings. Apart from that, Pinara is still largely unexplored. So far there have been no excavations worth mentioning. Pinara was early Christianized and bishopric. In Byzantine times it apparently fell victim to an earthquake in the 9th century. The city was then abandoned under pressure from advancing troops. The British archaeologist Charles Fellows rediscovered it in 1840. You can reach Pinara via the coastal road D400 between Fethiye and Kalkan. Coming from Kalkan, approx. 3.5 km after the village Eşen the signposted road to Pinara branches off to the left. From there it is 6 km to the city. Coming from Fethiye, direction Kalkan, follow the D400 for about 13 km to the junction of the D 350, from there it is about 20 km further on the D400 until you see the brown signpost to Pinara on the right. From there it is 6 km to the city.